I like to shower in both the morning and night, so I like to keep my cleansers in the shower. I keep a balm cleanser and an oil cleanser in the shower and use one to remove my make up. 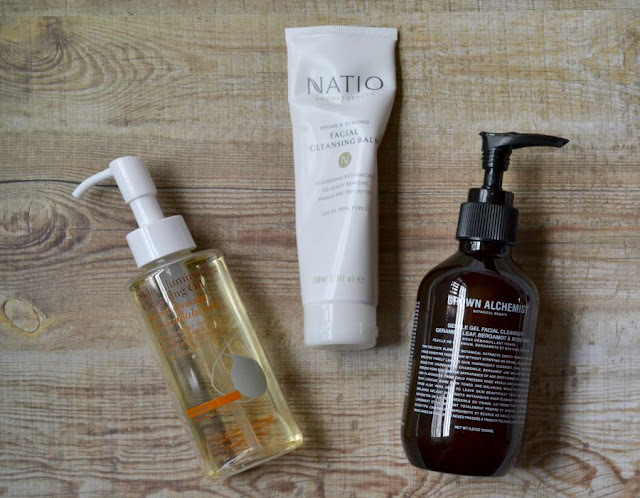 I like the Natio Argan & Almond Facial Cleansing Balm. * Even though it has a balm consistency, it's in a tube not a tub. It sometimes does get a bit stuck in the packaging but all I need to do is hold it in my hands for a minute to warm it up and melt it a little bit. When I don't have a clean wash cloth, I like using an oil cleanser. I'm loving my Coast To Coast Skin Illuminating Cleansing Oil. It's lightweight and removes my make up quickly and easily. I've talked about these cleansers previously here. I've recently started using the Grown Alchemist Gentle Gel Facial Cleanser: Geranium Leaf, Bergamot & Rose Bud after picking it up from Priceline for only $10 (it's normally $39.95!). I really love this cleanser and will be picking up another one very soon. 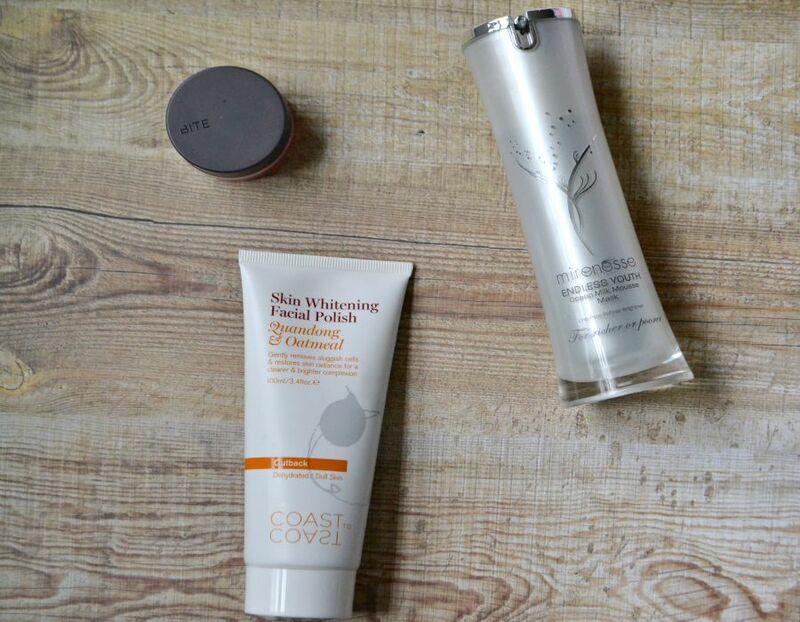 I adore the Coast To Coast Skin Whitening Facial Polish. It's the perfect amount of grit without feeling like it's cutting up my face. It also smells incredible. I like to use it every 2nd or 3rd day depending on how my skin is feeling. I like to keep a face mask in my shower otherwise I forget to use one. Since I've moved my face mask into the shower, I've started to use it once or twice a week. I'm currently using the Mirenesse Endless Youth Ocean Milk Mousse Mask. It goes on as a gel then starts to change to bubbles which pop. It's an unusual mask but I love the feel of it. It also smells like peppermint and is sooo lovely. I've also started to put a lip scrub in the shower so I can use it on those days when I want to wear lipstick. I'm currently using the BITE Beauty Whipped Cherry Lip Scrub. It's a lovely scrub, but it's annoying that it's in a glass jar. 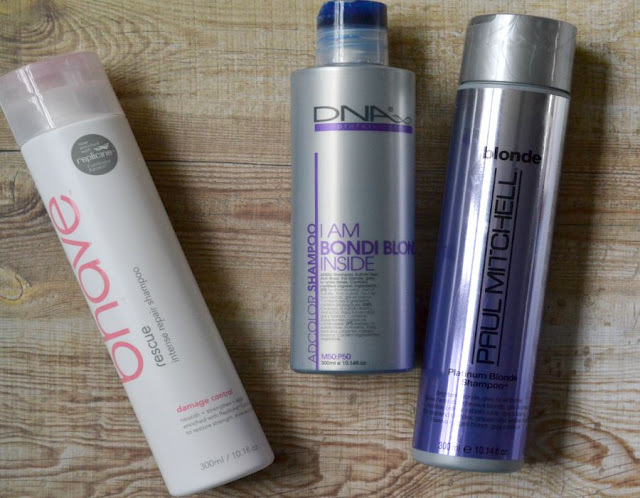 I've mentioned the bHave Rescue Intense Repair Shampoo* countless times on Bottled Beauty. It's my go to product because it helps to strengthen my hair and leaves it feeling soft and smooth. I use that as my first shampoo to help clean my hair and remove any styling products. I then use a blonde shampoo to help banish any brassy and golden tones. I have 2 that I'm currently using. I bought the DNA Professional Adcolour Bondi Blonde Shampoo from my hairdresser. This is a seriously incredible toning shampoo. It's a bright blue shampoo and leaves my blonde hair very very bright. I use this every fortnight, as I find if I use it too much my hair will go grey/pastel blue. It's highly pigmented so I need to make sure that I rinse it well from my shower or it can stain it! 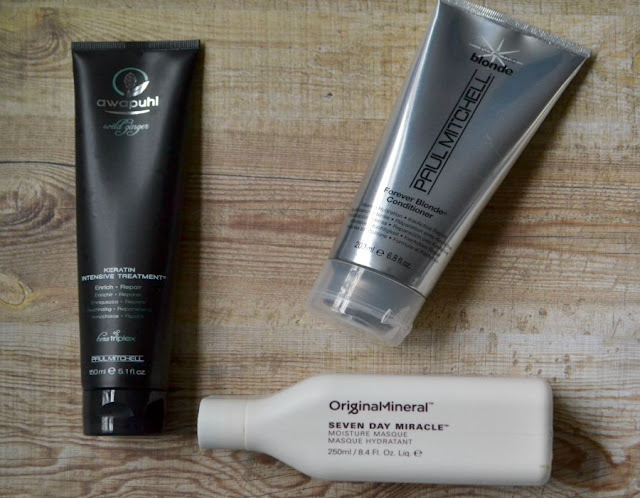 The other shampoo that I've been using is the Paul Mitchell Platinum Blonde Shampoo. * It's a purple based shampoo to help banish brassiness. When I use this I feel like I'm in a hair commercial as it leaves my hair glowing and shiny. I try to make sure I use a hair mask weekly and like to use it after shampooing and before conditioning. I've been rotating the Original Mineral Seven Day Miracle Moisture Masque with the Paul Mitchell Awapuhi Wild Ginger Keratin Intensive Treatment. * I then have been following it up with the Paul Mitchell Forever Blonde Conditioner. * This conditioner is great. It leaves my hair feeling so soft that I could use it alone and my hair would still feel silky. I like to use 2 different body washes. I normally use something uplifting in the morning and something calming at night. The A'kin Orange Blossom Body Wash* is a lovely one to use in the morning because it's an invigorating scent. At night I adore using the Molton Brown Renew Ambrusca Cleansing Shower Oil. * It's an oil that turns into a soapy milk when you wash it off with water. It helps to relax my body and mind as well as moisturising my skin. I love this and wish that they had more fragrances in the shower oil formula. 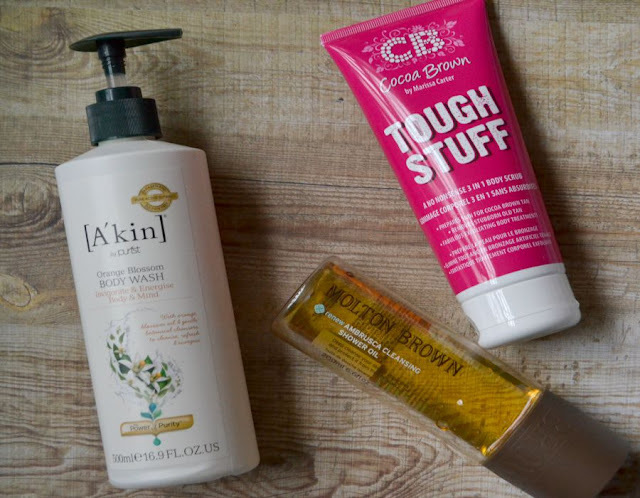 Molton Brown also have some sleep products (you can see them here) which I want to try because with 2 young children, I need all the help I can get to have a good nights sleep. I also keep a body exfoliator in the shower. I really like the Cocoa Brown By Marissa Carter Tough Stuff 3 in 1 Body Scrub. * It's quite a grainy consistency, but they're small so they don't feel rough. I really love using this on my feet after a long day because I massage it into my feet and it feels so relaxing. And those are the products that I use on a daily and weekly basis. Do you keep your cleanser in the shower? That Original Mineral! I love that stuff so much, I bought back ups! It's awesome... and smells AMAZING!! Good to know that Natio has a balm cleansers. I've been wanting to try one of those but wanted an affordable one! It was an amazing bargain. I'm kicking myself for not picking up more. The Mirenesse Ocean Milk Mousse Mask sounds like something that's right up my alley! I've fallen completely in love with the packaging!